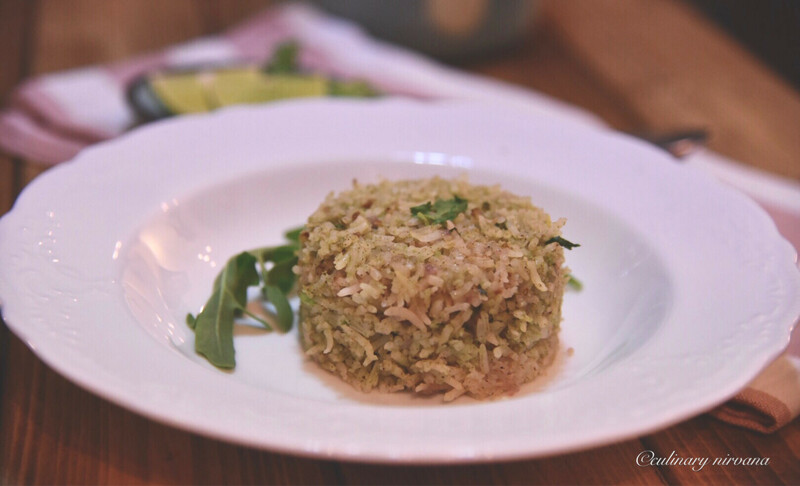 “Fried Rice” a simple yet flavourful rice dish which can make any meal delicious! There are many different way I make Fried Rice and if you follow me on Instagram you would know from my stories that we are a rice loving family! I love eating rotis (flatbreads) but my husband is rice lover and he loves different types of rice dishes so I try to come up with new rice dishes all the time. 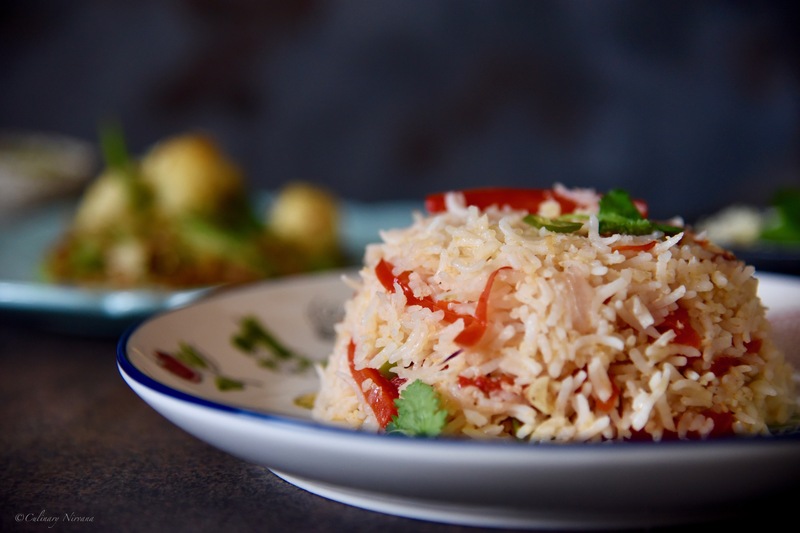 This Fried Rice is more like an Indian style fried rice, it’s a bit spicy, it’s buttery and it’s crispy in texture. 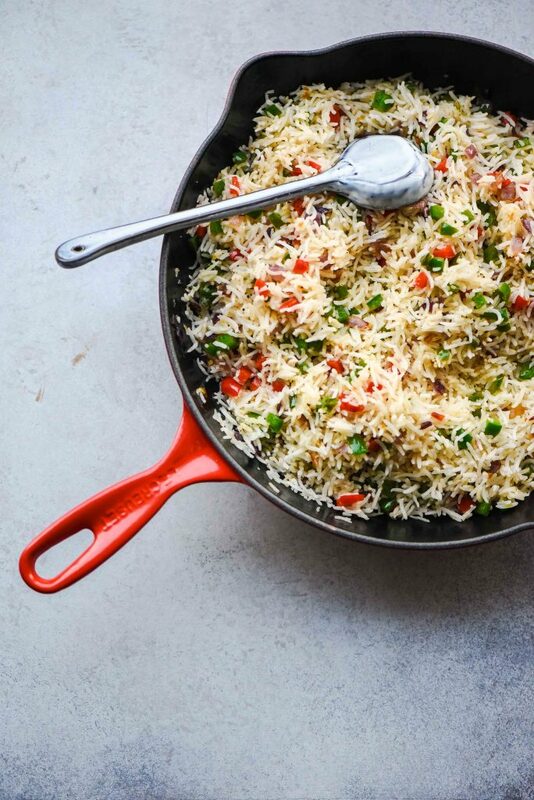 To make it more delicious I like to make my rice dishes in cast iron pans and I made this one in my absolute favourite Le Creuset skillet and trust me on this it tastes wonderful! Talking about cast iron pans, I get a lot of messages asking me what are the best quality pans for cooking and should you use non stick pans. Well for me cast iron pans are always been my number 1 favourites, I reckon food (specially meat dishes) cooked in these pans have a great taste and fantastic flavour. So yes, invest in some good quality cast iron pans and get cooking! 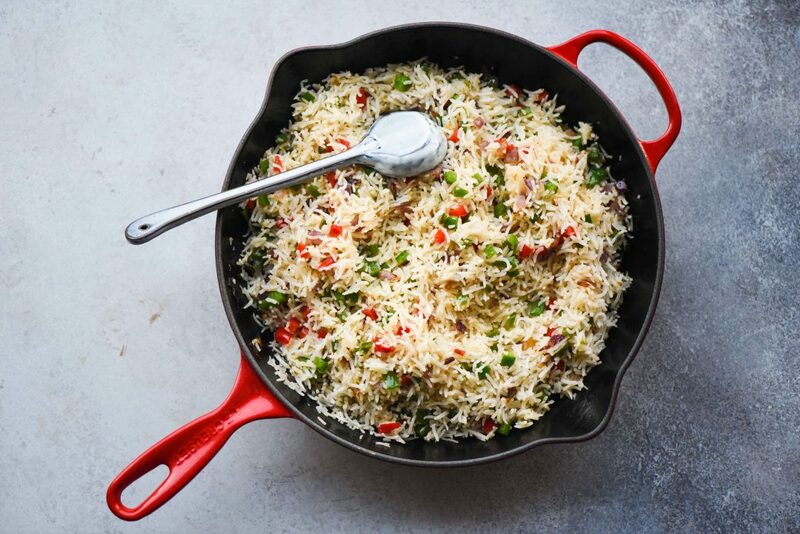 If you are rice fan the do check these recipes out. 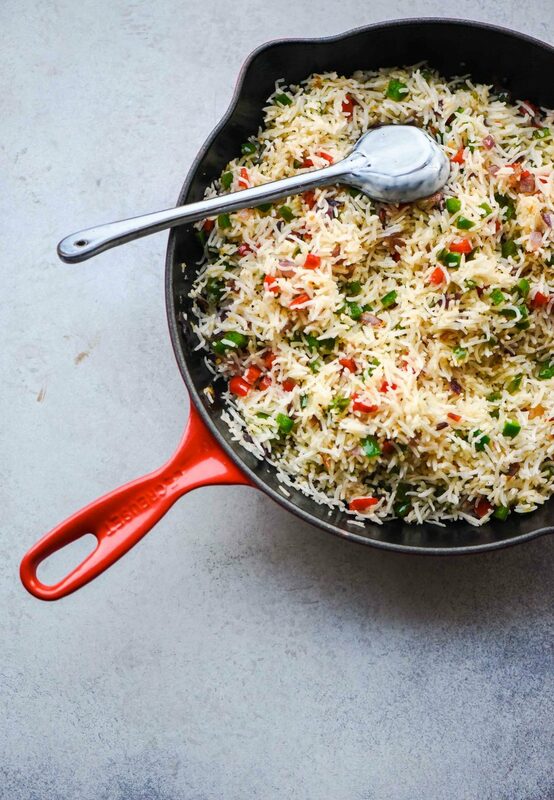 So this is how you make this simple Fried Rice! Heat ghee and 2 tsp butter together, add in the garlic and saute for 1 minute. Add in the onion and saute till the onion is golden in colour. Add in both the chillies, coriander stalks and continue to fry for 2 minutes. Now add in the capsicums, salt and pepper. Saute for just 1 minute. Now add in the rice, sprinkle some water and continue to fry for 5-7 minutes till the rice is golden and crispy from the bottom. Add in the rest butter, mix well. Garnish with freshly chopped coriander and serve hot with any curry of your choice.